This week I got my new iPad Pro and what can I say? It is the tablet I have been waiting for! 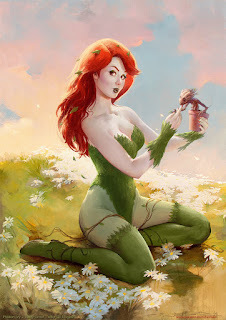 In this article I will explain a bit why it ends up being just right for me. Hopefully the comparison list below helps you to decide for the right mobile device as well. I´m a tech geek so I always try to keep up with the relevant news. But that does not mean I need to have the latest stuff. Since 2008 I tried to find a suitable mobile device to support my digital workflow in addition to my desktop workstation. I did not expect to find something that can replace my i7 powerhouse anytime soon. Instead I want a devices that can enhance my experimentation and allow for some minor productivity abroad. It seems many digital artists or designer want something that enables them to get rid of the desktop as a workplace. But my observation and experience over the past 7 years about that matter tell me that this is not entirely possible. You either sacrifice mobility or power - or in the worst case both. If it comes to a tablet or mobile device we tend to think it has to be a jack of all trades. But most people forget that there is just not the space to fit so much computer in. And while the iPad Pro is around 20 times faster as the first iPads, it is still limited. And so is any convertible, Ultrabook and even workstation like Notebooks. In general a great device. What I hate about it is the small screen and the lack of battery power (only 4-5hours on the SP2). In my opinion, the step away from Wacom as digitizer towards N-Trig makes it difficult for artists to decide if it is a good change or not. Here is an unbiased article about the advantages of each technology. My experience with the SP2 over more than 2 years now show that the UPS-cable is decaying and random BSOD´s happen. Worst of all is the forced Windows update on Windows 10. It randomly prevents the Surface tablet from going to standby and thus resulting in a battery drain. Sad but true, as a conclusion it is finally the Operating System that breaks an otherwise good device. Microsoft also had a chance to show how well their own system could work on their own device to establish standards but they failed. In the end it is not all bad, what I like is the portability and the support of fully fledged apps like Photoshop CC. - The Macbook as also any other portable i7 or Xeon workstation notebooks will get noisy when running in power-mode. - Everything below, say i3/i5 will usually drop GHz speed to cool down the processing unit. What I like about OSX and a Macbook Pro as a companion device is the different software. Some exclusive OSX tools like Pixelmator, sketch or Affinity Photo are great Adobe contenders. 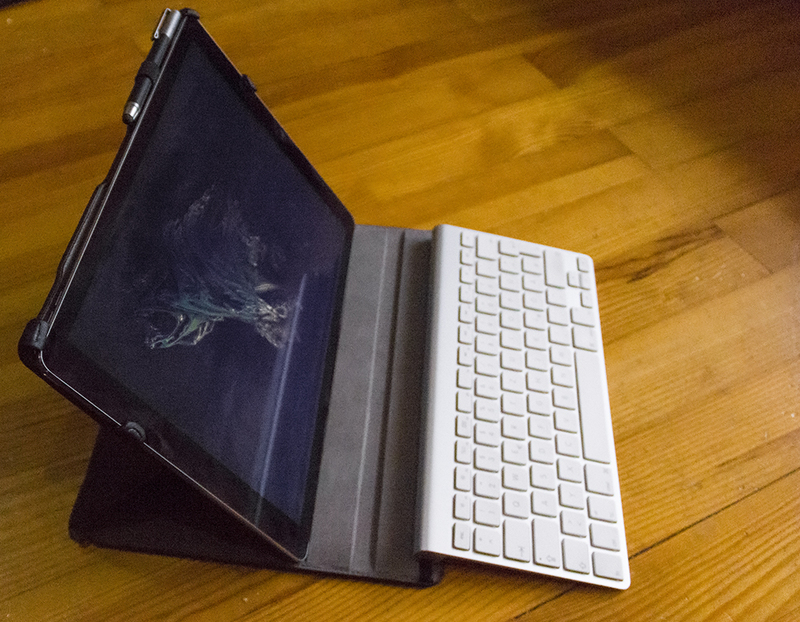 Also the compact form-factor allows to write better on the go especially with backlit keyboards. Unfortunately that is not always useful for digital artists. The Wacom Companion is a full workstation with 13" display and Wacom intuos pen. What I like about the Companion models is that you can plug it into a Mac or PC and use it as a regular Cintiq device. Also the Intuos pen is still one of the best pens and with 2048 levels of pressure sensitivity, awesome. Actually I never had a companion but I know of some artist friends who had it, but all have sold it or wanted to get rid of it. That makes me think. Android Tablets were never an option for me. I can only tell from playing with tablets from friends, what others told me or what I can read from the specs in a product description. What I hate about Android is that it treats open apps in the background really bad. And so you are always closing any app that is not in use and you still run out of memory. Also updates are dependent on carrier or reseller which bears several security risks. And last but not least the security and approval of apps in the google play store is depending on the user. This way you can´t be sure if you get malware and other potentially unwanted software. What I like about Android is the thought about a unified open Operating System. Also the prices for most tablets, even big ones, are low. But in the end this low price can not make up for bad memory handling - because in the end struggling with the OS is pulling from your time. Modbooks are a very special case and probably the only real "Jack of all trades" because they feature retina display, macbook power up to the i7 models along with full fledged app support, 15" displays, etc. - The weight - even with a smaller retina macbook, the weight and height is too much for a mobile device. - Neither the Modbook Pro, nor the Modbook pro X have touch functionality. What I hate about it is that in general iPads do not support usb devices and that it requires itunes to synchronize or backup. -There are lots of creative apps for artists and musicians. Many of these apps take advantage of the most current OS and hardware. And my personal favorite reason to get the iPad Pro is Procreate. In the list above I tried to cover (not quite) equally the list of advantages and disadvantages. Sure thing; this list is biased. But it reflects exactly my thoughts about different options at the given time. One thing generally applies: working on a mobile device IS different and therefore needs the user to set different priorities. If you have to write a lot, an Ultrabook or Macbook air might be the best for you, if you have to paint it becomes a bit more difficult. When I attended life-drawing sessions this year with my Surface Pro tablet and a keyboard on the side, it felt OK. But still, it did not feel naturally. It is naturally when working on the desktop, because on my standing desk it is the most efficient way to get things done. When working on a mobile device, I knew my perception had to change, regardless if I´d decide for a new Surface Pro or the iPad or something else. The change is not about adapting to a new hardware, but getting into a new way of thinking. Contemplating the use of a mobile device, you find that touch is the best option to navigate through a system. If you compare touch funtionality, be it Microsoft, Wacom or Apple, like it or not, you will find that apple is the clear winner here. This explains why the first iPads were made for the masses: Everyone can use their fingers, but not everyone can make good use of a stylus. It can be argued if the pro in the name of the new iPad is meant for professional use. But what is true is, that appart from some specific apps, the main market for the iPad and all other devices was and still is media consumption. A "pro" in the name does not magically change that. It is up to the user to decide if you want to create something or if you simply want a healthy mix of both. 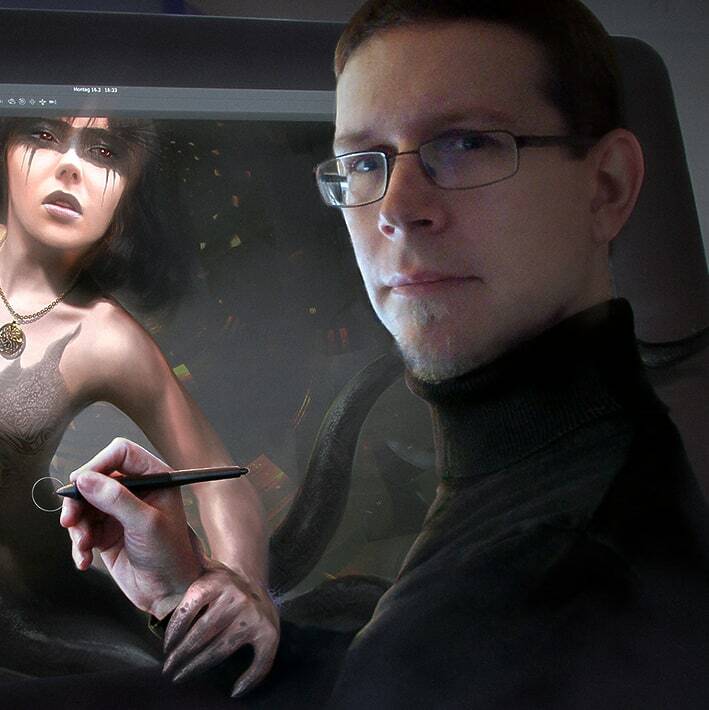 Every gamer-pc is also great for creating digital 2D art, but not all workstations are great for gaming. In regards to that, the iPad is the exception. Mainly because everything that is for work, works faster on the iPad Pro. But games also look nicer and work better too. In my opinion it will be a great tool for artists, musicians, creative explorer and designer who like to experiment and get rid of the desktop workplace more often. So I believe many enthusiasts will like it as a consumption device. But it is a serious contender and even better than your old Macbook pro. I actually sold my mid-2009 Macbook pro with SSD and 6Gig of Ram update because the iPad Pro is faster, has more battery power, is less heavy and does everything the old Macbook did - just more beautifully. 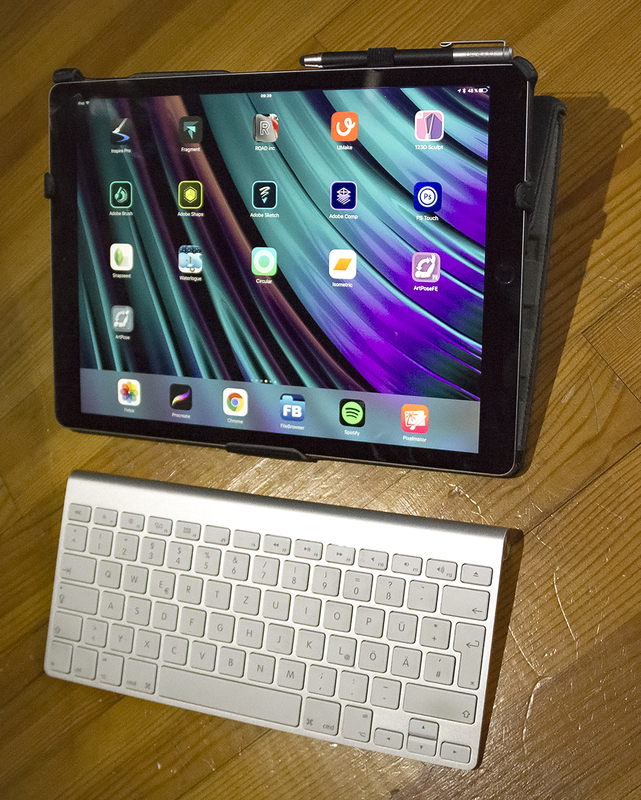 Now, there are a few drawbacks to consider when getting an iPad or iPad Pro as mobile device. There is no USB connector that works in both ways - towards and from the device. But there is Filebrowser and loads of cloud services to synchronize or to send files between Mac/PC and iPad faster. Another setback I found is that there are no keyboard shortcuts that could be utilized for my workflow. 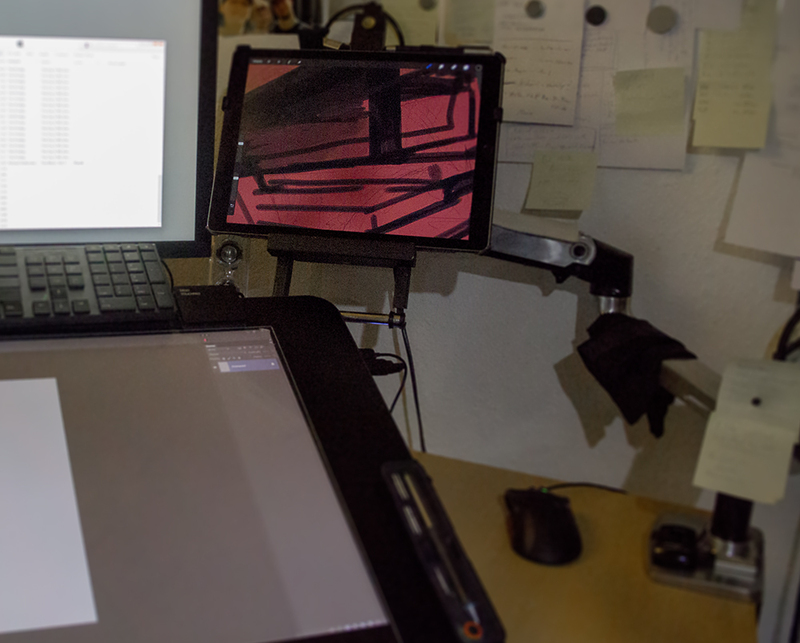 In the case of Procreate, gesture support makes up for that lack. Many other apps use the same gestures so it requires a learning curve, but a small one in my book. Right now I will forward a bunch of tasks towards the iPad Pro. Thumbnail sketches, posebook or lifedrawing studies and general content for my ongoing Patreon campaign. Then there is the need for a bluetooth input device if you seriously want to draw or paint on the iPad. Good devices range from $50 to $120. The apple pencil falls in the latter pricing category, but from the specs, it seems to be worth it. An established strategy for producers of mobile devices is to sell everything separately such as keyboards or stylus, whatsoever. So this is nothing new. The only new thing about it is that this pencil (apple insists that it is not a stylus!) comes from apple. Prior to that only third party vendors offered pressure sensitive input devices. Here is an update about the apple pencil: .../fantasios-apple-pencil It is better than expected, that´s why you find everything about it in a new article. So far the iPad pro will not be the ultimate jack of all trades for me and it might not even come close in the near or far future. But that is not necessary at all. 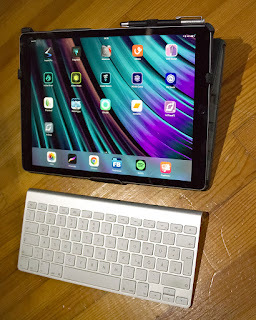 As it is now, I rely on two devices for mobile use; one is the Surface Pro 2 for all tasks that require a full Desktop OS and apps like Photoshop. Compatibility to usb drives and filemanagers like the explorer help to deal with a wide variety of issues. And even if the SP2 still does the job nicely with the i5 and 4Gig ram. I doubt that more power will be necessary anytime soon. While filemanagement is necessary from time to time, the fun part starts when I can work on the iPad pro. Be it for sketches, rough concepts or even finishing a complex piece in Procreate. Even in the day-to-day business transfering tasks to the iPad such as writing blog articles makes sense and a lot of fun. Diving into Frax-HD to capture screenshots, is a great example of playful experimentation. The most notable aspect of experimenting this way, is, that it is fun again and feels not so much like work. For me it is important to turn some "work" into fun and I want to see possibilities in apps that are meant for consumption. Being so fast as the iPad pro, it was never so much fun doing just that. I only hope that generative apps like JD reflect from Joshua Davis will get an update or an alternative. Because that is where potential in experimental creation really is. A Surface Pro with i7 and 16Gig of ram and 512 gig of storage space can most likely outperform an iPad pro, but against a desktop i7 workstation it can never compete. So I have to compare the iPad with a contestant in the same price range and that is in my opinion the Surface Pro 2/3 i5 version. Simply forget about the idea of having a workstation with you at least for the next 5-10 years. I did. Technology evolves, but the digital and 3d artist is so demanding in ram, gpu and processing power, it will be hard for any company to deliver such an allrounder soon. What are your experiences? Do you have questions? Any tech blogs of note that deserve being seen? 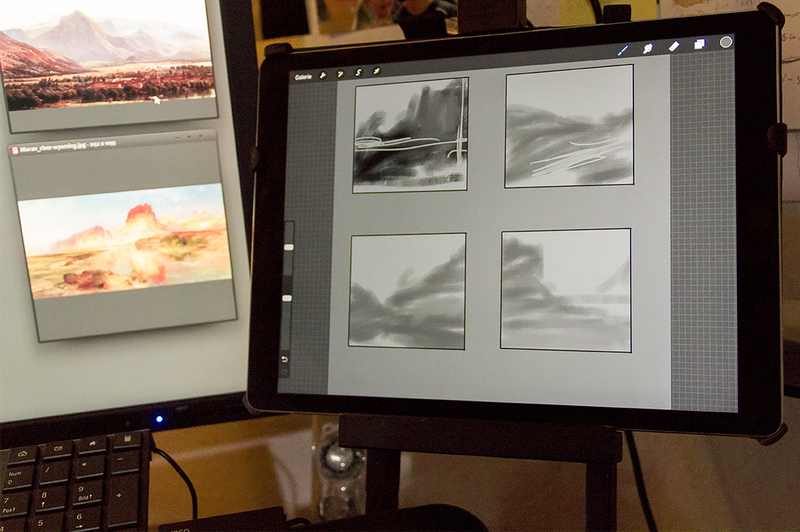 If you have an iPad pro contender and need a pro artist to take it for a test-ride, feel free to contact me. Hi Oliver, thanks for the comprehensive article! Gotta say, I *love* my 3rd-gen iPad, but it is starting to show its age and I will probably end up replacing it next year. I am tempted by the Surface Pro, but the big turn-offs for me are the price and the fact that it runs Windows 10, which I have mixed feelings about. Originally, I was drawn to the stylus as standard plus it could run all the Creative Cloud apps. I wasn't aware that they'd changed the stylus technology, however, and I'm also no longer the fan of Creative Cloud that I used to be, in fact I've started using other apps for parts of my workflow. 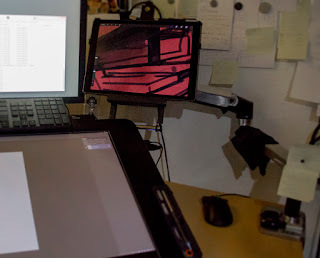 For now, my 2011 iMac and Wacom Bamboo still do sterling work, and the iPad acts as an adjunct that allows me to keep a lot of social media and other distractions off of my work screen. :) I will probably get an iPad Air or iPad Mini this time next year, then nearly-new / used models will be going cheap. I definitely love my Surface pro 2 and opposed to other devices on the market it does not show age apart from the peripheral things mentioned above. These are bothering but not essential.